Quite apart from arcane details of cat history, Moncrif's Les Chats preserves for us many splendid titbits concerning contemporary pet cats and their aristocratic and literary lady owners. Paule-Françoise de Gondi (1655-1716) duchesse de Lesdiguières, was a wealthy young widow and the niece of Cardinal de Retz. There is a portrait by Antoine Pezey (with an engraving by Drévet) which shows her with her beloved cat Ménine on her lap. Ménine, it may be noted, was not an angora but an ordinary grey cat with yellow/gold eyes. 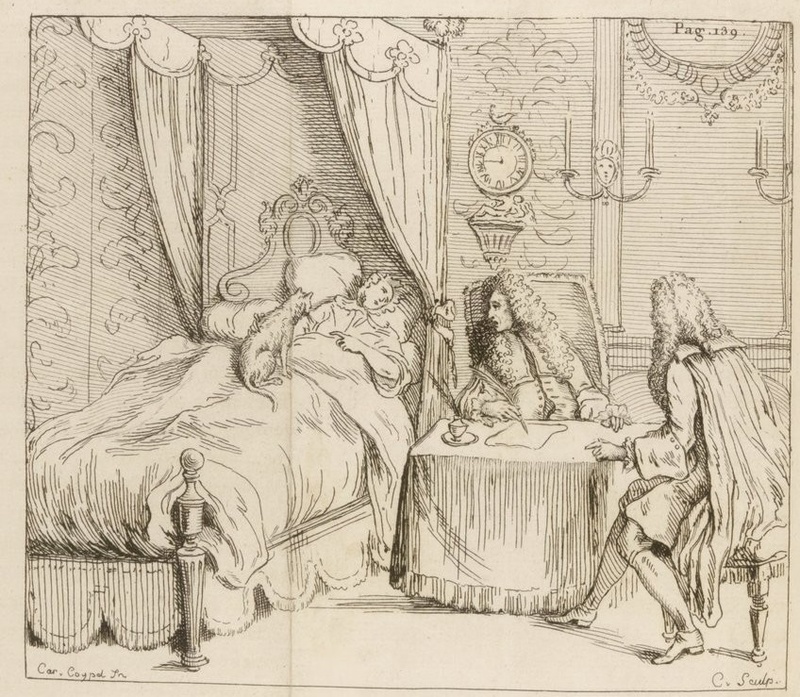 Her death in 1684 at the age of eight was commemorated in a sonnet composed by no less a personnage than François-Séraphin Régnier-Desmarais, the perpetual secretary of the Académie française. Moncrif reproduces this "famous sonnet" which centers on the slightly improbably theme of the little she-cat's fierce chastity. Here it is in French - I can't find an English translation and I don't intend to attempt one! Elle n'ait écouté les amoureux regrets ! C'est une triste vie, & puis la mort après. Pourquoi le dire? On le voit bien. There are various descriptions of the monument and, thanks to the illustration in Moncrif's book, we know exactly what it looked like. 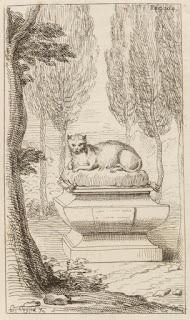 An effigy of beloved feline reclines on a cushion with a base in the form of a funerary urn. The figure of the cat was apparently in black marble and the rest of the monument in white. The hotel was later demolished but it is said that the remains of the mausoleum were briefly rediscovered during the course of construction work for Hausseman's boulevards in the mid 19th century. Carmes exquis pour la charmante Issa. Evoquerois si fameus personages ! De ce Rondeau qu'amour m'a sçu dicter. So famous a dead personage as he. This poor rondeau that Cupid wafts your way. Half an hour before he expired, he made his distress known by wanting to be carried into the apartment of his illustrious mistress. Once beside her, he mustered all his remaining strength for the most tender of farewells; a few moments later, he made it known he wanted to be carried out, no doubt to spare her the sight of his death; he was taken back to his chamber where he expired. His final breath was one of those gentle tender miauws he was accustomed to make to when honoured with the caresses of the mistress who had given him such fame. Moncrif says that he himself has written an epitaph for the cat, but prefers to publish the one written by "Monsieur de la Mothe". On the strength of this, the poem is usually ascribed to François La Mothe le Vayer (who died in 1672!). My money is on Antoine Houdar de la Motte, a ubiquitous figure in the salons of the early 18th century. And sleeps for ever in a marble bed. Alas! what long delicious days I’ve seen! Your ancient glory was less proud than mine. Was nobler far than to be deified. 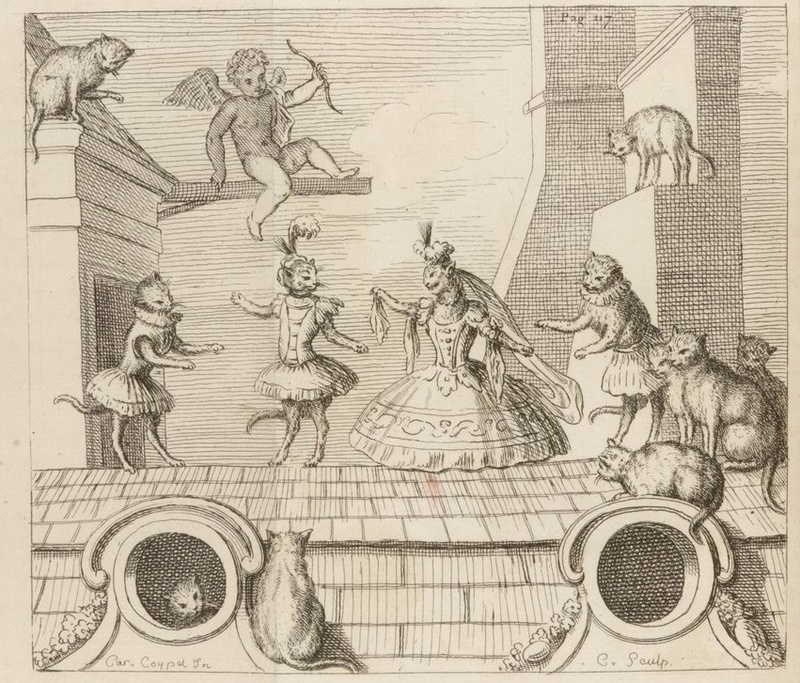 In Letter Ten Moncrif describes a celebrated legal case which involved a harpist, one Mademoiselle Dupuy, née Jeanne Félix, who died on 7th October 1677 leaving two houses and a substantial pension to her pet cat. 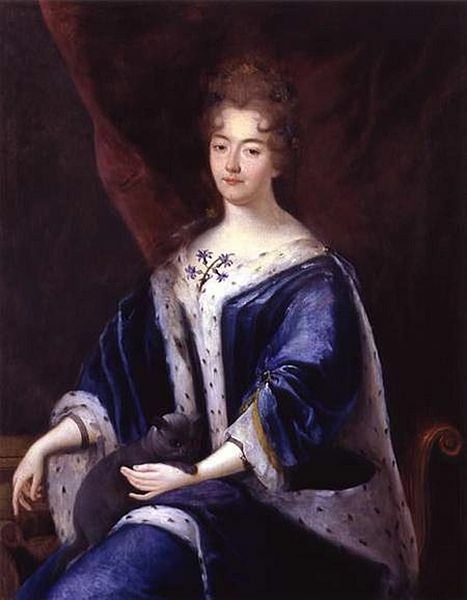 It was Mlle Dupuy's conviction that she owed her skill as a musician to the cat, who sat beside her while she performed and gave her the benefit of his critical appraisal. Sadly the will was contested and relatives eventually wrested the bequest from the unfortunate feline. The story made a stir at the time; it was written up in the Mercure galant for July 1678 and even earned a mention in Bayle's Dictionnaire. Les Chats has an illustration showing the musical puss on the deathbed of his mistress whilst two attorneys draw up the will. Mercure galant, July 1678, p132-138. Antoinette du Ligier de la Garde Deshoulières (1637-94) was a writer of Epicurean lyric poetry much admired in the later 17th century. She published various popular idylls in which her cat Grisset and various pets belonging to her friends are endowed with human sensibility. Her half-serious theme was that animals who follow nature, live more wisely and enjoy greater happiness that do human beings. At the end of his book, Moncrif reproduces a set of madrigals, which take the form of love letters between Grisset and Tata, the marquise de Mongla's neutered tom. Grisset assures the unfortunate Tata that she seeks only a gallant friendship, but he rejects her declaration of platonic love; there is no such thing as a feline Lucretia; they should flirt as is the nature of cats. Grisset then falls for Cochon, the dog of the maréchal de Vivonne. 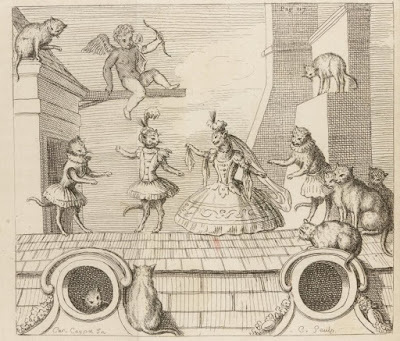 The same characters reappeared in Les Chats ou la mort de Cochon, a "lyric tragedy" of 1688, which Moncrif also reproduces. In Letter Eight he solemnly advocates a performance of the piece by a troupe of cat actors. There is even a splendid illustration. Moncrif is on my list of French and German cats books to translate and put online in English, but it hasn't reached the top of the pile I'm afraid.